Roofers Nation provides expert ridge vent installation, soffit vent installation and gable vent installation in both reroofing and new roof applications. The importance of roof ventilation is often overlooked. This is understandable when you consider that the most important job for any roof is to keep the building dry. But a well-ventilated roof can make life easier and better for those living beneath it –by lowering heating and cooling costs, improving interior comfort, and granting longer life to roof shingles. Ridge vents. Installed along the roof peak, ridge vents are probably the most important vents in any "passive" (non-electric) roof ventilation system. Hot air that accumulates inside the attic rises by convection and escapes outside through ridge vents. As hot air escapes, fresh outside air is drawn into the attic through soffit vents (see below). Installed along the eaves of the roof, these vents are usually in the form of grilles that run the length of each soffit. By admitting outside air into the attic as warmer air leaves the attic through higher vents, soffit vents play a major role in effective roof ventilation. Gable-end vents. Installed near the peak of a gable end, this screened vent can allow hot air to leave the attic or fresh air to enter, depending on prevailing breezes and temperature conditions. Powered attic ventilators (PAVs). Sometimes referred to as attic fans, PAVs come in several forms. Some are designed to be mounted on the roof, while others mount in the attic floor or the gable end. All PAVs contain an electrically powered fan (usually controlled by a thermostat) that exhausts hot air from the attic on hot summer days. If your roof is not well ventilated, ask a roofing contractor about improving roof ventilation with ridge, soffit or gable-end vents. All of these roof vents can be installed in an existing roof, or when your roofing is being replaced. 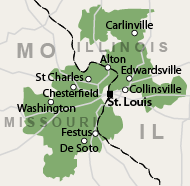 We work in St. Peters, Chesterfield, O Fallon, Granite City, St. Louis, St. Charles, Florissant, Ballwin and nearby in Missouri and Illinois. Just call us today!